WHMCS Widget For Zendesk is a free addition which you can easily install in your own Zendesk. It allows you to see a preview of customers' details, products, domains and due invoices stored in multiple WHMCS instances within the Zendesk admin area. Installation process of this widget is very simple and should not cause many problems. Let's begin! 1. Download the widget from here and extract it. 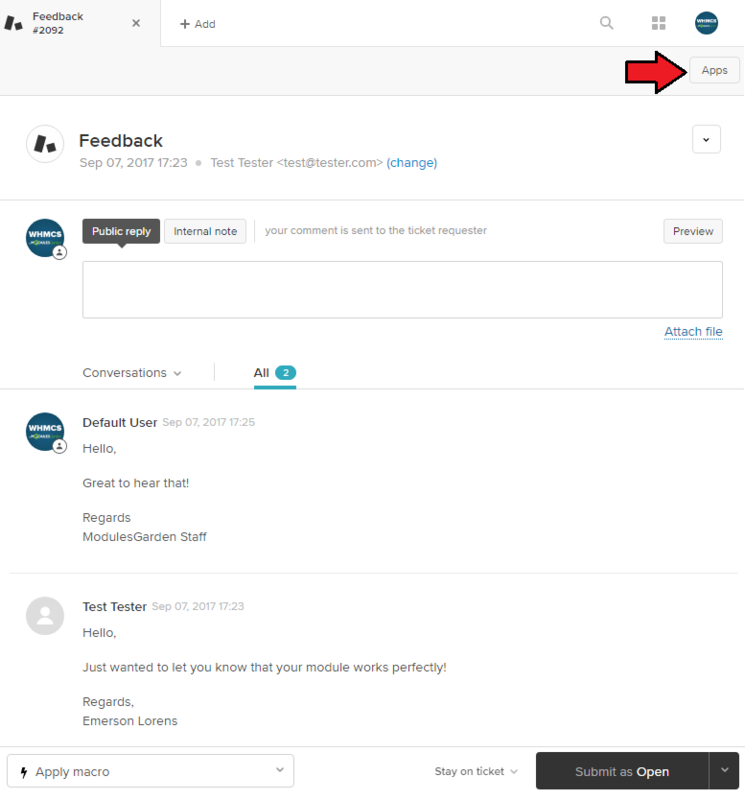 You can also install it directly from Zendesk Marketplace. whmcs_customer_info_app.zip - actual app you need to install on your Zendesk server. includes - folder that you need to upload onto your WHMCS server, required for successful connection. 2. 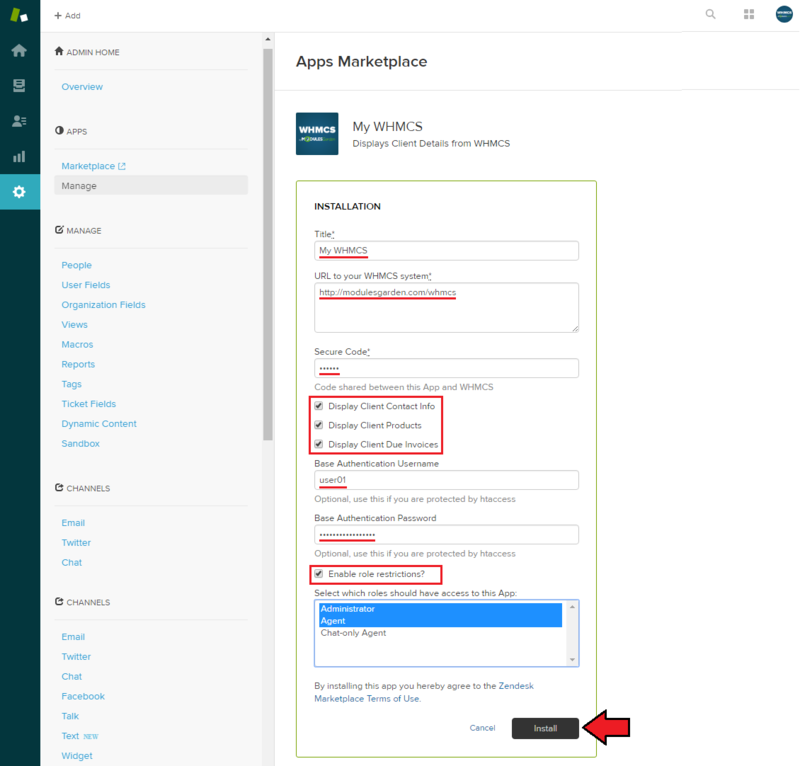 Log in to your Zendesk admin area, go to 'Manage' under 'APPS' category and click on 'Upload private app' button. Note: If you do not see the 'Upload private app' button, then you most likely have an insufficient plan. Private apps are only available for 'Professional' and 'Enterprise' Zendesk plans. In that case try installing app directly from Zendesk Marketplace but you will still have to manually upload some files to your WHMCS. 3. Afterwards enter app name, add previously downloaded 'whmcs_customer_info_app.zip' file and press 'Upload'. 4. Enter the title, URL to your WHMCS system, secure code, then check the options that interest you the most and finally click on 'Install' button. 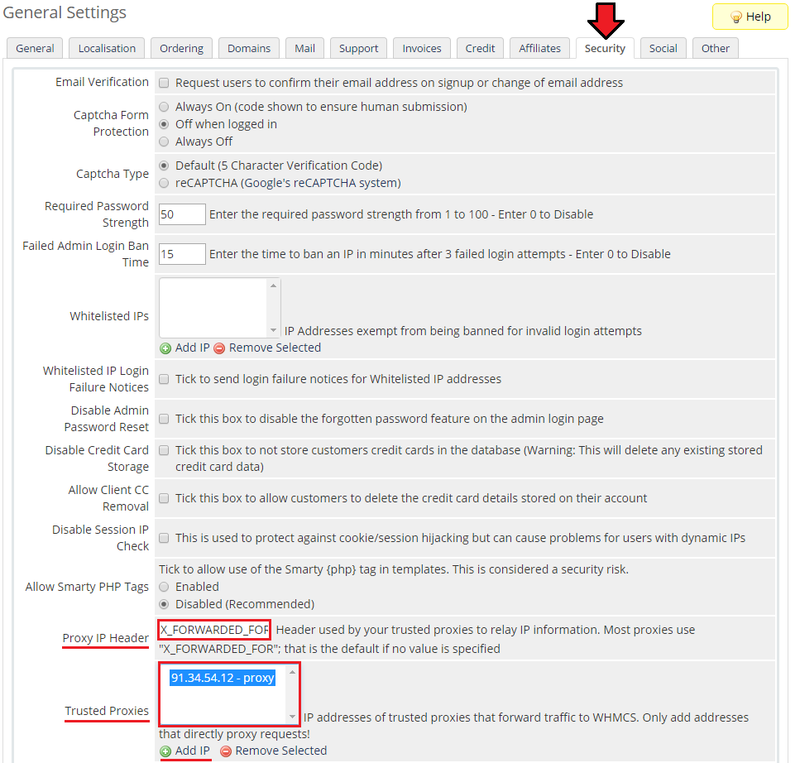 In addition, if your WHMCS is protected by a base authentication, you can enter the username and password for your .htaccess. 5. As it is shown on the screen below, app has been installed correctly. 6. Afterwards upload 'includes' folder, mentioned in the 1st step of this guide, into your main WHMCS directory. 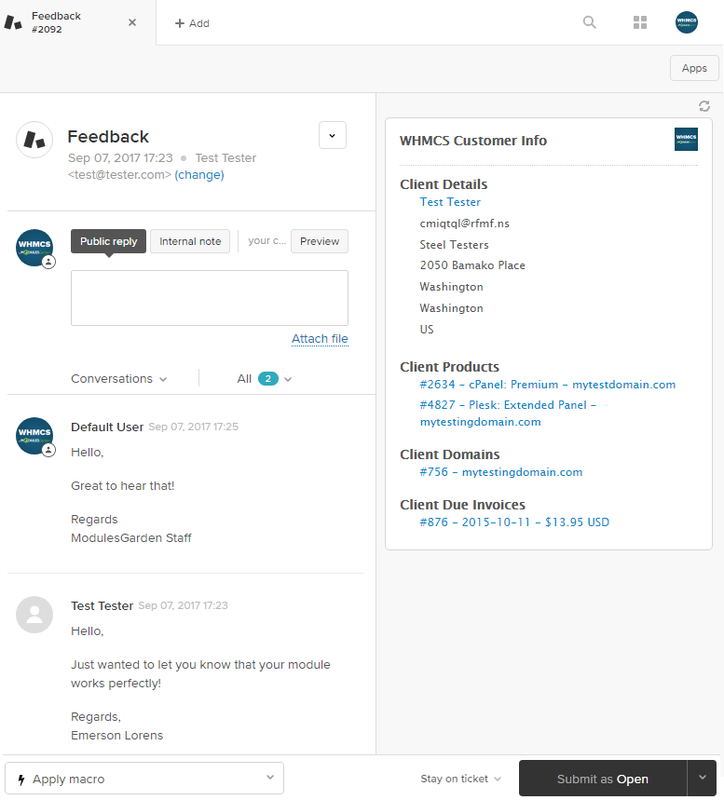 Files included in the folder are responsible for communication between Zendesk widget and WHMCS data. Proceed to 'your_whmcs/includes/zendesk_app' and set 'unauthorized_access_attempts.txt' file as writable. Note: You can obtain from this file the required Zendesk IP addresses. 7. Now, edit 'customer_info.php' file. Enter your secure code into $widgetSecureCode variable and whitelist Zendesk servers IP under $widgetIpWhitelist variable as presented on the following screen. Note: Please keep in mind that there are more possible IP addresses, keep track of the Zendesk official documentation with the current list. 8. That's all, you have just successfully finished the installation of WHMCS Widget For Zendesk. Let's check the details of your WHMCS customer in Zendesk. To do so, press 'Apps' button when viewing a particular client ticket. 9. On the right side of the screen you can see now complete client details, information on products, domains and due invoices. Additionally, you can quickly get more details about specific customer info with just a single click. 1. If you are using proxy the module also supports the 'Proxy IP Header' and 'Trusted Proxies' provided in WHMCS security settings. 1. Wrong IP Address: This problem occurs when connection to WHMCS is not authorized. Reason: IP address of the host, which is trying to connect, is not on the whitelist. Solution: Add the IP address to the '$widgetIpWhitelist ' array at the top of the customer_info.php file. You can find IPs of the recent connection attempts in 'unauthorized_access_attempts.txt' file (the file needs 'write' permissions). 2. Wrong Secure Code: This problem occurs when the secure code is not set properly. Reason: Secure code set in Zendesk APP is not the same as '$widgetSecureCode' at the top of the 'customer_info.php' file. Solution: Set the same code in both places. 3. Client not found: This error occurs when the client is not registered in WHMCS. Reason: WHMCS cannot find the client's email in the database. Solution: Register the client in WHMCS. 1. Connection Error: This problem occurs when Zendesk cannot connect to WHMCS to get the client's details. Possible Reasons: URL to your WHMCS system is not set properly. Firewall, .htaccess etc. is blocking access to the 'customer_info.php' file. Solution: Check URL set in APP settings. Allow access to the 'customer_info.php' file from the outside of the server (you can also try to access the file from your browser). This page was last modified on 14 June 2017, at 16:03.